The new Work Health & Safety (WHS) information (replacing OHS) is included in the 2014 edition of the Stage 6 Industrial Technology Workbook. This Workbook is used by most IT students in NSW and has been updated for 2014 with the latest WHS and course changes. The Workbook contains all of the elements of the course so that students can gain confidence from private study of the Industry Study, Graphics, WHS, Major Design Projects, Design, Management & Communication, MDP Examination Marker's Criteria and information on the HSC Written Paper. It also presents students with a step-by-step approach to the MDP and provides a sample of an outstanding MDP Portfolio by a student who received maximum marks for the folio at the HSC. The Workbook also provides a check list for the 6 focus areas so that students can tick off syllabus requirements after class presentation as well as during study/revision for examinations. A major advantage of this workbook is that it provides students with an up-to-date resource that they can use at home for private study and from which they can obtain an accurate idea of what is required for this course. Preliminary & HSC Course Requirements; A Suggested 2 Year Industrial Technology Program. Introduction; Freehand drawing; Presentation graphics; Steps in constructing Isometric drawings; Steps in constructing oblique drawings; Steps in constructing a presentation graphic; Student tasks on presentation graphics; Orthogonal drawing; Steps in constructing orthogonal drawings; Student tasks on orthogonal drawings; Signage; Putting logos on MDPs, Graphice in IT focus industries. WHS; Environmental & Social factors; Design for Industrial Technology students; Elements of design; Principles of design; Aspects of design; Communication techniques; Planning a project; Managing a project; Student task; Literacy; Numeracy; Communication; Student task; WHS - PCBU rights & responsibilities; Workers rights & responsibilities; Risk assessment & hazard control; Personal protective equipment (PPE); safety signage; Student task; Environmental factors; Student task; Sociological factors; Student task. Background information on the focus area; How to use this section; Other things to prepare for the HSC written paper. What is the Industry Study? Why and how is the Industry Study done? 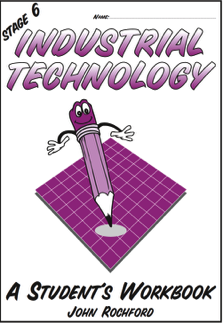 The Year 11 Industry Study questionnaire; A sample Year 11 Industry Study Report; The Industry Study in the HSC year with suggested report headings. What is the Major Project? What is a management folio? How and when will the projects be marked; Advice on selecting the Major Project; Getting started on the Major Project; Your Major Project folio - how to do it; An example of an outstanding Major Project folio that achieved maximum marks at the HSC. Glossary of examiantion terms; The structure of the HSC written examination, Tips for answering IT HSC questions - sample questions from Sections I, II & III with comments and advice; Examination technique; Links to the BOSTES website regarding past examination and marker's comments.